Hey guys, sorry about the delay in content. Had a busy few days. Today I want to talk to you about Easter Eggs. I know Easter is coming up, by try not to link what I'm saying to chocolatey treats. You all probably know what I'm talking about but for those who don't - Easter Eggs in Games are messages, features or jokes the fans can relate to intentionally left by developers and they can be in the form of pretty much anything. They can be in game Items, locations, NPC Dialogue the list goes on. Finding things like this always brings a smile to my face. Many people have different opinions on what they consider an Easter Egg, some people consider Glitches and Cheats to be Easter eggs. But I prefer to think of them as little notes, references and personal touches left behind by the developers that are very hard to find. For example if you look to the right, we have an Image that fans of Bioware games will understand. 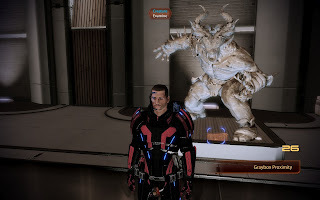 The Image from Mass Effect 2 shows an Ogre from another one of their successful games - Dragon Age: Origins. People who had not played that game would be none the wiser when stumbling upon this, even Kasumi (an in game character in ME2) states 'I don't know what this is'. There are also brilliant references to pop culture in many games, I mean just look at this list containing the currently known easter eggs in Skyrim, I'll admit, some are so subtle you think the person who discovered it is clutching at straws but others make you think "now that you mention it...". Bethesda pack their games full of these references, both the Fallout and Elder Scrolls series are full of them. Rockstar games, the developers of the Grand Theft Auto series tend to have a more obvious method of letting players know that they've found an Easter egg. In GTA:III there is a sign on a wall you shouldn't be able to access saying 'You shouldn't be able to get here! 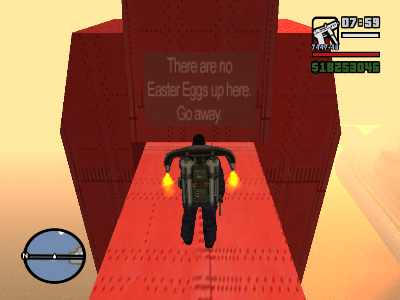 ', In Vice City, you can find a room with a chocolate Easter egg in the middle with 'Happy Easter' engraved on it and below is my personal favourite from San Andreas. Easter eggs for me are always a welcome find, more often than not they're something that will make you smile, and its always nice to see the developers put that tiny bit more of effort in to give the fans another thing to talk about in their game and a way to make their fans happy. If you fancy having a browse and seeing what Easter eggs are out there, eeggs.com has a compiled list of thousands of video game Easter eggdiscoveries. So what Easter eggs have you guys discovered?